after surgery and one week after his first acupuncture treatment. pelvic flexure impaction two years prior. On PE, GI sounds were absent and he was tachycardic. Abdominal ultrasound revealed two loops of dysmotile, distended small intestine with a thickened wall. 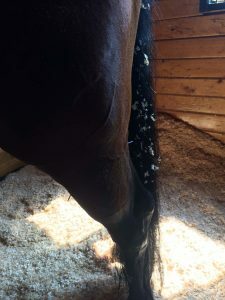 small intestinal lesion, Val was referred into the hospital. treatments, so I wanted to be able to add in acupuncture as an integrative therapy to promote GI motility. autonomic control over the GI tract. likely, repeat entrapment of small intestine or adhesions. are less likely sequelae this soon post-op. 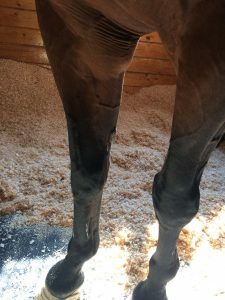 General soreness likely secondary to anesthesia/recovery. 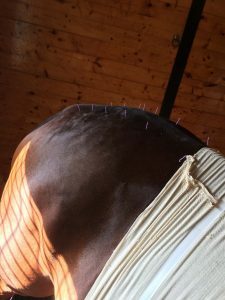 describing acupuncture as a treatment for equine POI. Scientific reports 7 (2017): 39801. Gastric Cancer.” Journal of gastric cancer 17.1 (2017): 11-20. – Schoen, Allen M., and M. Schoen. 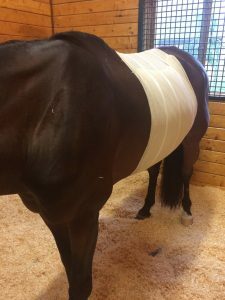 Veterinary acupuncture: ancient art to modern medicine. neurophysiologically.” Journal of Equine Veterinary Science 29.8 (2009): 642-644. – Robinson, Narda G. Cura Core Clinical Intensive Course Notes. April 2017.